COLUMBIA, Mo 8/6/15 (Beat Byte) -- If Columbia's new Town Boss super PAC -- the Foundation for Columbia's Future -- has taught anything about Columbia's future, it's that citizens who want to be heard need money. With that in mind, Repeal 6214 -- which delivered two petitions opposing the City Council's approval of the Opus student apartments downtown -- is now seeking contributions via the crowd-sourcing site GoFundMe. Money raised will defray costs for depositions, court reporters, and court filings in the Federal civil rights case Betty Wilson and Michael MacMann vs. City of Columbia and city manager Mike Matthes. Group members filed the case after city officials twice ignored thousands of verified signatures on the opposition petitions. Plaintiffs attorneys Jeremy Root, Josh Oxenhandler, and Richard Reuben took the case pro bono and will only recover their fees if the Plaintiffs prevail. The case is scheduled for trial in U.S. District Court in October. "Civil rights cases like this one are David vs. Goliath scenarios," said Columbia resident and Repeal 6124 spokesperson Pam Cooper. "Unlike the defendants, we don’t have extensive financial resources, so we make appeals to the public. Fundraising is a lot like petitioning: we can only be successful if everyone pitches in." 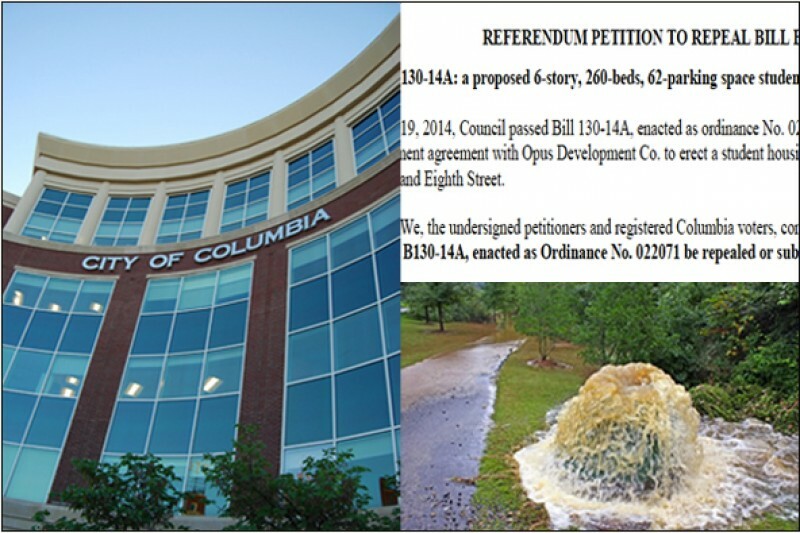 McMann/Wilson vs. City of Columbia/Matthes alleges city officials deliberately interfered with citizens’ Constitutional and City Charter-granted rights to petition their city government for redress of grievances, in this case Opus Group's use of taxpayer-funded infrastructure. High-density development is overloading the aging sewer main serving downtown. Manholes along the main repeatedly overflow and send sewage into adjacent creeks. Council members repealed their approval of the Opus development, but Matthes ignored them and issued construction permits anyway. "After repealing the Development Agreement ordinances, the City did an about face and decided that there was no longer a problem with its downtown infrastructure, at least for the Opus project," Federal Judge Nanette Laughrey wrote in a preliminary finding. "Understandably, the Plaintiffs and the thousands of Columbians who signed petitions are upset that the City is allowing Opus to proceed with its project when it is clear that the infrastructure problem in downtown has not improved sufficiently to address the impact of the Opus Development." The Central Missouri Citizens Council, a Missouri-registered, nonprofit organization, is managing contributions, which are not tax deductible.